“Here it is so different. It’s like coming from hell to heaven.” — Rabbi Dr. Isidore Kahan in the Seattle Post Intelligencer on May 1, 1939. 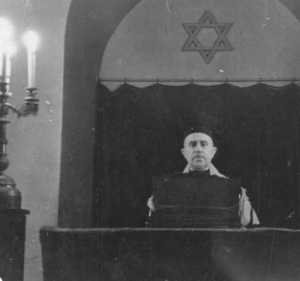 Rabbi Isidore Kahan at Sephardic Bikur Cholim, Seattle 1939, courtesy of the WSJHS collection at the University of Washington Digital Collections. As the vise around the Jews in Europe tightened, and Mussolini’s fascist laws placed restrictions on the lives of Jews in Italy and Rhodes in 1938, Seattle’s Sephardic community was determined to go “on the warpath every hour” to help their brothers across the sea. A front-page story from Seattle’s local Jewish Transcript (January 13, 1939) describes the emotional atmosphere at Congregation Ezra Bessaroth, where hundreds gathered to share letters from their relatives, each of which revealed “a situation so desperate as to defy description.” According to the Transcript, “audible sighs and sobs” erupted from the audience, as tears filled the eyes of every man, woman and child in the synagogue. 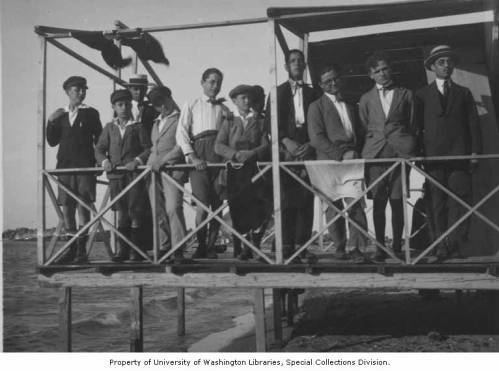 The Sephardic Jews in Seattle, who had come from Turkey and the Island of Rhodes decades prior, raised $6,000 to assist the plight of Sephardic refugees fleeing Mussolini’s rule. 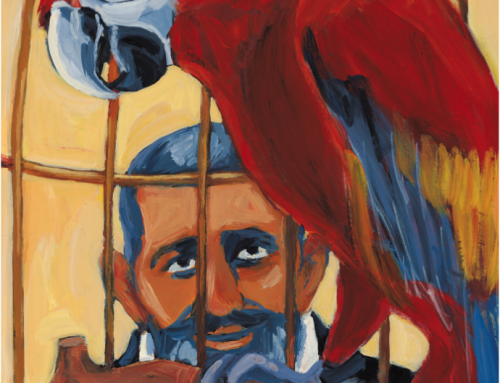 One of the results of this meeting was the safe arrival of Rabbi Dr. Isidore Kahan, his wife, Toni, and their young daughters, Judith and Naomi to the Pacific Northwest. [Toni] Buchbinder, the newlywed couple soon moved to Italy, where Kahan served as the rabbi of the small Jewish community of Gorizia. Kahan spoke German, Hebrew, and Hungarian and quickly learned Italian. Students of the Rabbinical College of the Island of Rhodes, ca. 1933, courtesy of the WSJHS archive at the University of Washington, Special Collections Division. In December 1928, Rhodes’ governor Mario Lago established the Collegio Rabbinico. Mussolini personally intervened to ensure that funds directed to the seminary in Rome went to Rhodes in order to spread Italianità, Italian culture, to the Italian colonies and even among Jews. Within months, Rabbi Kahan was recruited by the Italian government to be the administrator and head teacher of the Rhodes seminary, a decision that raises a number of intriguing, unanswered questions, such as: why was a Hungarian native selected for such a task? 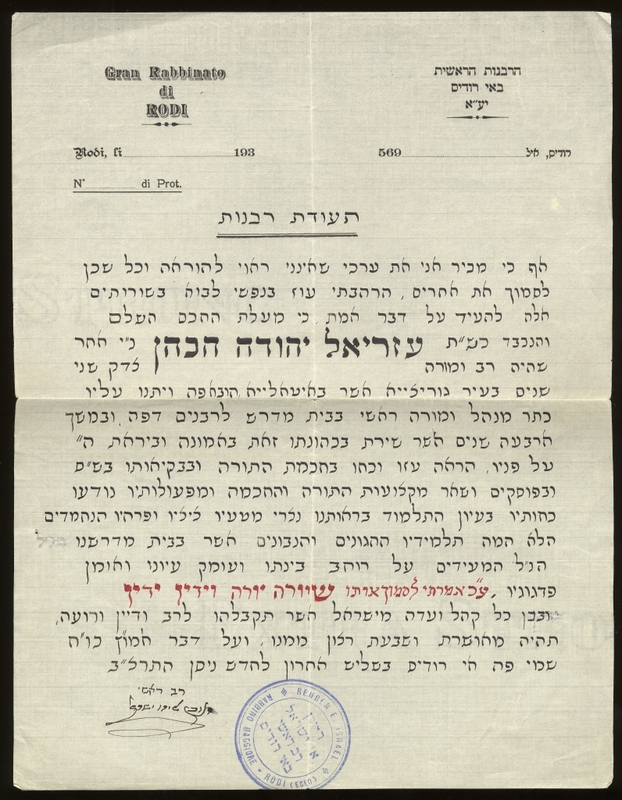 Dr. Isidore Kahan’s Rabbinical Certificate, signed by the last Grand Rabbi of Rhodes. Kahan served in the Rhodes seminary until 1933, when he was hired as a rabbi and professor at the Italian Rabbinical College in Rome, where he taught history, Mishna, Rashi and advanced classes in Talmud. However, as the tide in Europe turned, Kahan worked tirelessly to save his family from impending doom. 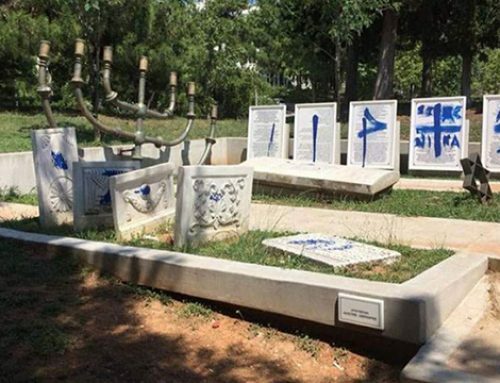 In a desperate letter to Rabbi Dr. Leo Jung, one of the major figures in Orthodox Judaism in the United States, Kahan describes the strain imposed upon his life after the many months of curfews and restrictions placed upon the Jews in Rome. “Under the present conditions, the very foundations of my existence are seriously threatened.” He concludes, “I would be sincerely grateful to you, if you would have me in mind for any pulpit being available even if it were in an Ashkenazic congregation.” Such a plea indicates that even though he was of Ashkenazi background from Hungary, by this time, given his experience in Rhodes and Rome, Kahan felt more comfortable in the Sephardic milieu. On March 9th, 1939, tickets were issued for Rabbi and Mrs. Kahan and their two daughters to set sail from Napoli to New York. 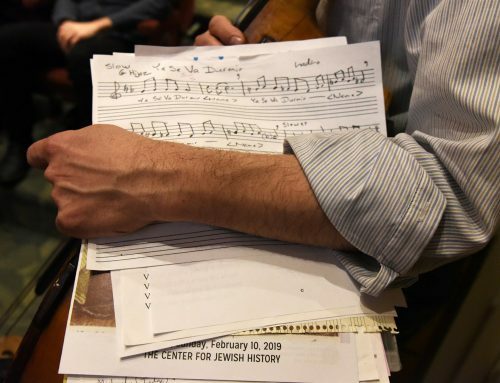 Three weeks later, Kahan received a letter from Sam Baruch on behalf of Seattle’s Bikur Holim Ahavath Ahim Congregation expressing the community’s excitement for his arrival. Baruch asked that Kahan send regards to Dr. David de Sola Pool, “who, after all, is directly responsible for the privilege and honor that our Community is about to experience in having you to look upon for their very much needed spiritual guidance.” As the famed reverend of Congregation Shearith Israel, the Spanish and Portuguese Synagogue in New York, De Sola Pool played an important role in orchestrating the arrival of Sephardic Jews fleeing Europe. At the train station in Seattle, many members of the local Sephardic community greeted the Kahan family. A fully furnished home was provided for the new arrivals, and according to Toni Kahan, they were invited to the homes of all of the local families for holiday and Sabbath meals. The Jewish Transcript covered their arrival with an article entitled “Sephardic Rabbi Kahan Greeted At Banquet by 500 Enthusiasts.” The banquet was held at the Talmud Torah, the local Sephardic school, and included speeches from Sephardic Bikur Holim president Sam Baruch, Ezra Bessaroth president Dr. Harry Tarica, Reverend David J. Behar, and rabbis from all of the local Ashkenazi synagogues. 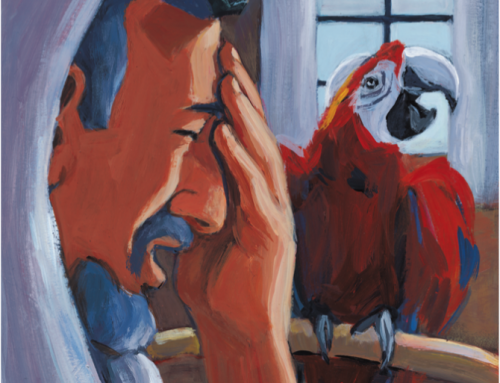 The family was warmly received, but the attempt to share the rabbi and to merge the Sephardic congregations soon proved untenable. Kahan served with distinction as the rabbi of the Rhodesli congregation, Ezra Bessaroth, until he retired in 1959, passing away in 1961. Two articles written by Rabbi Kahan from Congregation Ezra Bessaroth publications are now included in the Sephardic Studies Digital Library. These pamphlets from September 1943 and February 1945 were printed by Joe Souriano’s Columbia Printing Co. 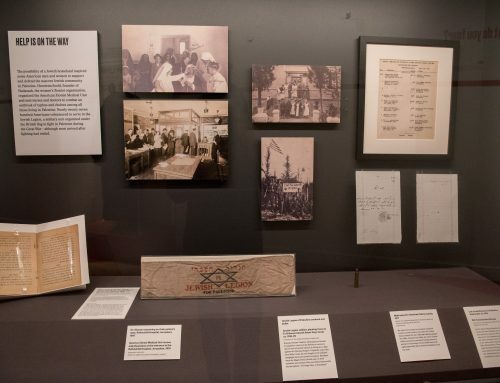 In the first pamphlet, Kahan sought to inspire his community to start living a life of purpose and meaning in the New Year (Rosh Hashanah) while comforting those families whose sons were fighting in the Second World War. He concluded with the hope that all his community’s service men would return home safely to Seattle. In the second pamphlet, Kahan encouraged his congregation not to despair even in the face of the reign of anti-Semitic tyrants in his article “Lesson of Purim: Let us be prepared.” Like other rabbis of his era and since, Kahan taught that his own generation faced modern Hamans–Hitler and Mussolini–but that eventually, divine providence would intervene and brave Jewish men and women, like Mordechai and Esther, would eventually rescue the people of Israel. 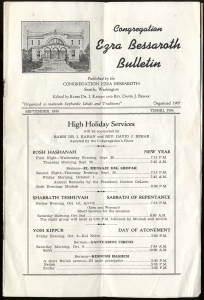 Congregation Ezra Bessaroth Bulletin, 1943. In Seattle, Rabbi Kahan also published two prayer books in 1947: “Service for the Eve of Shabbat “and “Service for the Eve of Rosh Hashanah.” As he explained in the book’s foreword, “The Hebrew words, which are presented in Latin characters herein, follow exactly the original, with the vowels and construction in the Spanish pronunciation to which we are accustomed.” Kahan was concerned that the younger generation was unable to follow the rapid reading of the Hazan–and may not have been familiar enough with Hebrew to follow along at all–and hoped that this booklet would inspire the younger generation and increase participation in the synagogue services. Enjoyed reading and having access to so many Sephardic related articles. The article on Rabbi Kahan by Ty Alhadeff was of special interest as it listed my father Joseph Souriano and his Columbia Printing business. I am both pleased and surprised that his services were in such demand and he was able to provide the resourses. 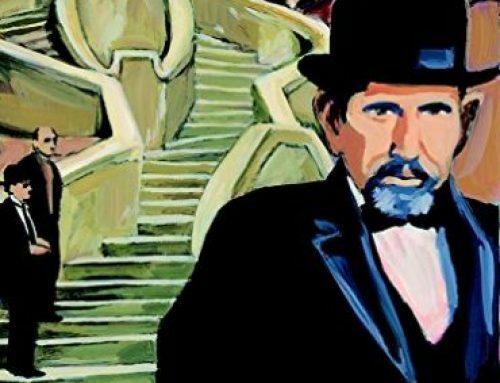 I was delighted to receive this article by e-mail from cousins.Rabbi Kahan was my great uncle, unfortunately I never met him, but I am in touch with his daughters Judy and Naomi. My Brother in -law is Rabbi Shimon Benzaquen from Seattle. With best wishes Deanna neeKahan Margulies.